My wheelchair travel experience is probably not the best way to start, though were some rather funny anecdotes that are stories in themselves. Patience dear reader – it can wait and will fill up quite a bit of space in the days and weeks to come. The only thing worth mentioning – and here’s a kindly shout-out to the relevant parties – is the Disabled Assistance service at Gatwick North. Enough said until I can write a whole page on it! Not the smoothest of experiences and could be improved. 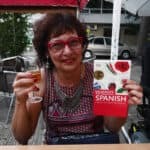 Apart from hitting a 40C wall of heat upon arriving in Seville and a kidnap attempt by local taxi mafia (yet another hilarious story for a subsequent blog! ), I did arrive in Jerez intact though a little worse for the wear as testified by the photos. Anyhow, here I am. In Jerez at last, and since I was a tad sluggish this first morning, I managed to get lost in the old town. Luckily, we found a very helpful Tourism Office and managed to trundle back to the hotel in time for some respite from the gorgeous but extremely hot sun. Phew! Bottles of water stashed in my side-bag, and overloaded with wheelchair charger, laptop and various sundries, we fully explored the town. Reccing means taking charger just in case the Powerchair battery runs out – testing, testing! I did a trial run with heavy bag on knees in sweltering sun, photos as proof, and all good – no need for charger for a half-day. Jerez is truly a beautiful town – my kind of place – filled with dazzling light and vibrant colours. Turn a corner, and you encounter small, unexpected plazas filled with lime, acacia and jacaranda trees, tiny cafes and restaurants serving delicious tapas. Very disability-friendly apart from some bone-shaking cobbled sections. The only issue around the ‘café culture’ of living and sitting outside to escape the heat is if you wish to work in the room, like me: in the hotel room, we found unfortunately no coffee-maker and surprisingly, no fridge. The check-list for any subsequent working trip is growing longer. But that’s what I’m here for – to pave the way for others, test and trials so I can impart my knowledge and make things easier for others. A bold pioneer, I am! Off for spa and massage to soothe away travel pains and loosen aching body for tomorrow’s flamenco session, so hasta la vista amigos! Ps Must put in some serious thought into how I can finance an off-roader with long mileage range and better suspension. Crowdfunding?! Please sign up to updates from my website. You can also follow my story via the Twitter hashtag #PowerchairWriter @leblackwood or on my new Facebook page. Many photos, blogs and videos in store! A journey to Spain….break out time! I am an eternal optimist and a striver even though logistics for ‘movements’ can be restrictive and horribly frustrating. My Arts Council grant includes part-funding for a number of days that should be dedicated to writing and since the beginning of the year, I have had three attempts at organising this – all failed for one reason or another but mainly due to the excessive hike in prices this year. Also because I need accompaniment and am unable to travel and sort myself out on my own. But I have finally managed to break out! 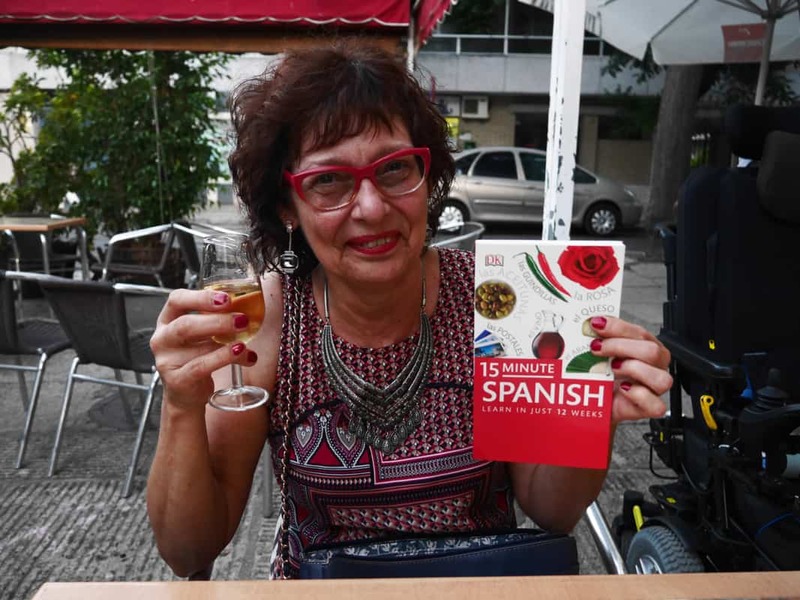 All the required conditions came together and I will be travelling to Jerez de la Frontera and Seville in Spain on 29 August for 13 days and exploring the inspiration of flamenco dance and music. My friend and writing colleague Amy Zamarripa Solis will be filming and helping me to post blogs and videos during my travels. I will possibly have a couple of lessons in flamenco upper-body movements to use when performing in my wheelchair, so there are bound to be some good laughs in store. 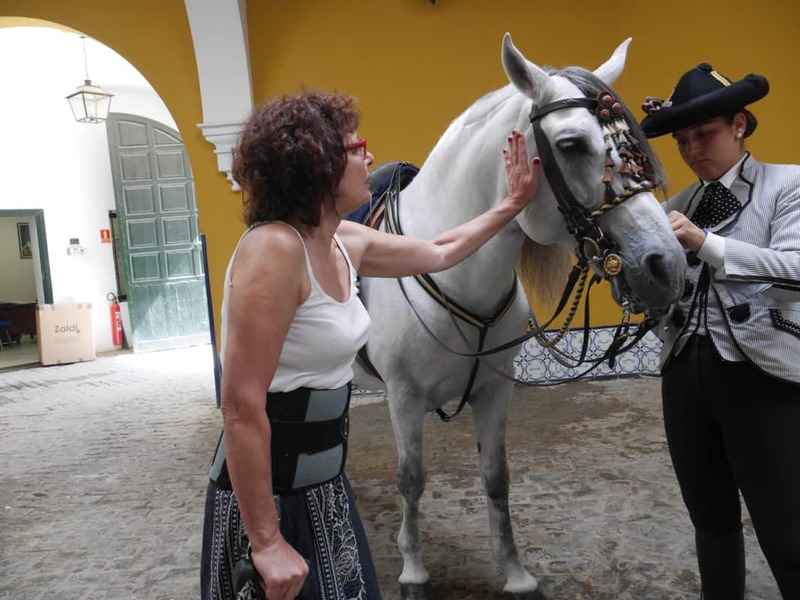 During my trip, I will be exploring the link between North Indian-descended Romani people who migrated to Spain and brought their music and dance with them to Andalusia. I’ll be taking pleasure in the Royal Andalusian ‘dancing’ dressage horses (I used to go horse riding). I’ll touch them, feel their strength and admire their beauty. I might even try and find a performance of the female flamenco dancer who dances a duet in the bull ring with a prancing white horse. This long-awaited journey will open my body and soul, and drench them in sensations, smells, sights and sounds. Then I will write, pour words onto paper, and sing and rejoice at the fullness of life.